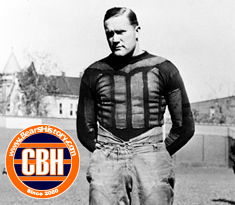 Healy was called "the most versatile tackle to ever play the game" by George Halas. Originally a member of the Rock Island Independents, Healey is remembered as the first player to be "acquired" in NFL history when his rights were purchased by Halas for $100 in 1922. Enshrined in Pro Football Hall of Fame in 1964. Died in 1978 at the age of 83.